Custom Printed Blues Brothers Sunglasses are available in Red, Blue and Neon assorted color choices. Along with the stylish looks, these custom party sunglasses are also providing UV400 protection for a good experience wearing them in the sun. Get your brand logo or name imprinted into the 2" x 5/16" imprint area on their left arm to get the best brand exposure. 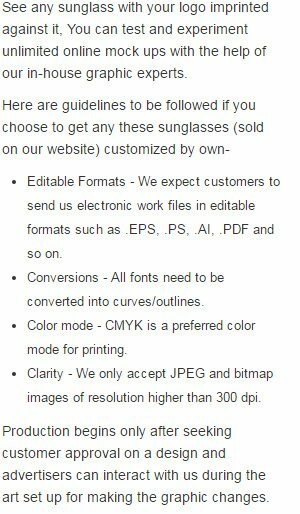 Presented in one size fits most adults, order these custom sunglasses quickly to get our free artwork design and free online proofs facilities. Request a quote to know wholesale savings for these Custom Printed Blues Brothers Sunglasses. When ordering blank items of this product either exactly 1 or atleast '+24+' must be ordered!